Sometimes it is a challenge to involve a diverse audience in the modeling process of a complex system. It is important that you adequately reflect the complexities of the system while at the same time present the results clearly and concisely for people that have different perspectives. 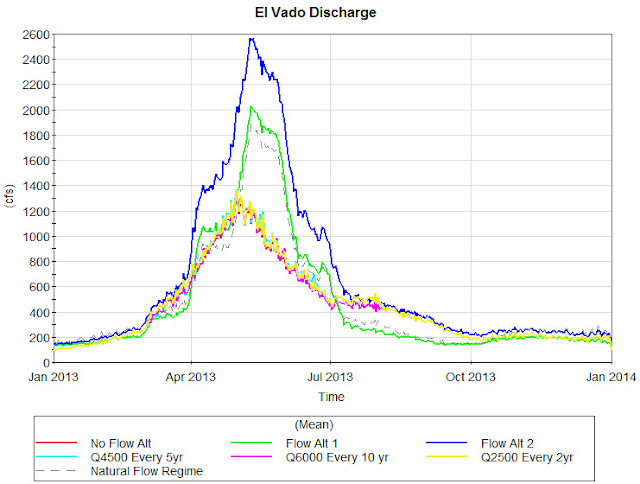 Recently, Ryan Morrison (USGS) and Mark Stone (Assistant professor at UNM) were able to leverage the visual and dynamic strengths of GoldSim to successfully involve a diverse group of stakeholders in evaluating flow alternatives for the Rio Chama basin, New Mexico. I wanted to highlight this modeling application because of its unique approach within the world of dynamic simulation and to demonstrate the utility of GoldSim's new scenario management capability. 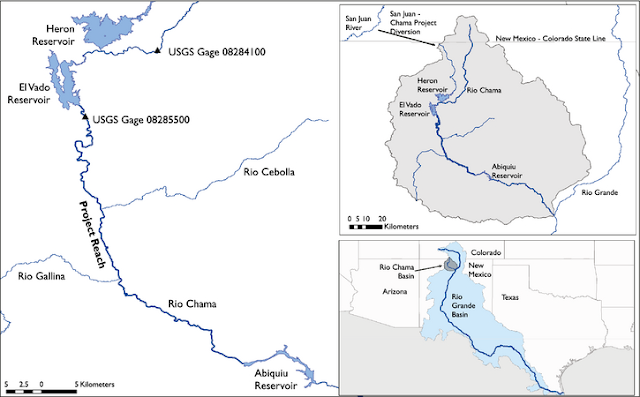 A diverse team of experts, including ecological engineers, riparian ecologists, geomorphologists, and environmental law experts collected data along the Rio Chama river basin to develop baseline and environmental flow alternatives. These alternatives were constructed in GoldSim and results presented to the stakeholders, consisting of government agencies, water users, recreationists, and hydropower operators. Evaluations were based on impact to flood and water supply management, hydropower production, and recreational use. A collaborative approach was used to help facilitate stakeholder involvement while considering the multiple uses of the river basin along with changing climate conditions. A full summary of the project was published in the Journal of American Water Resources Association (JAWRA) in August 2014. In addition to the article, you can download a copy of the model, from Ryan's website, here. Refer to Figure 1 for a location and map of the project site. 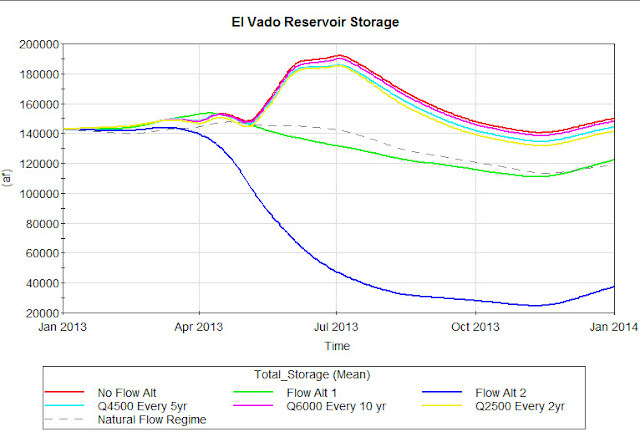 The model was built to represent the upstream river flows, operations of the Abiquiu and El Vado reservoirs, future basin conditions, and economic considerations of the system as they are assumed to change over time. Figure 2 is a screen capture image of the GoldSim model, shown at the root level. I found it very easy to navigate my way around this model and quickly understand the basic functionality, modeling assumptions, and operational logic of the reservoirs. Overall, this is a well-built model and has a lot of potential for future work. The results of the modeling work show that the proposed environmental flow alternatives generally cause decreases in reservoir storage while increasing discharge in the spring season. Impacts to hydropower and recreational boating appear to be minimal. Since this model was developed originally, we have added the capability to the software that enables storing of scenario results, which can be used for comparing alternatives. This makes it even easier to perform analyses and present results for various alternatives. 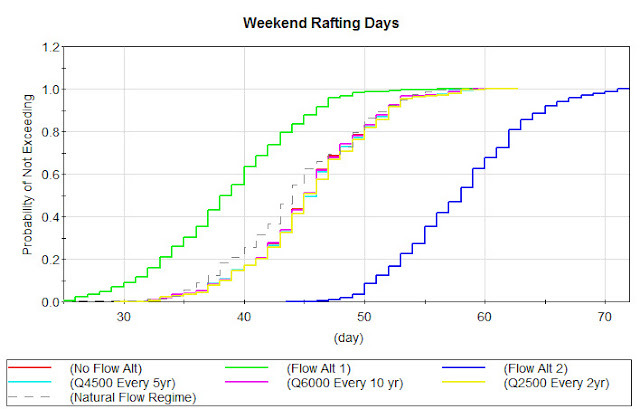 Below are plots developed from an updated version of this model, showing the comparison of key outputs for the various scenarios evaluated. In addition to adding the scenario manager, I took the liberty of changing the monthly stochastic variability to a daily variability to reflect the daily time step. The result of this change is a smoother transition from month to month. Figures 3 through 6 show scenario result plots after running the model with the new Scenario Manager in place. While these results are preliminary and do not necessarily reflect the author's intentions, I found, after spot checking, that the results are quite similar. With the scenario capability in place, it is very easy to visualize and compare scenarios. This model is well-built and demonstrates the benefits of employing a dynamic simulator with probabilistic capabilities for collaborative evaluations of alternatives. Because the model was well organized, it was very easy to update it. 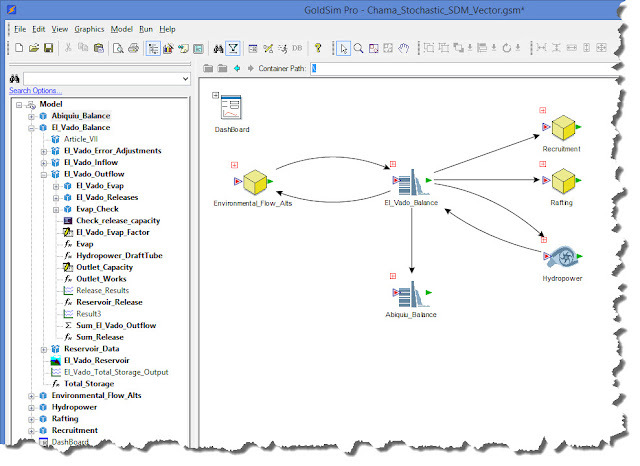 Adding GoldSim's scenario management capabilities makes it possible to more effectively visualize the results as the alternatives are defined and studied. During stakeholder meetings, plots like the ones above might be displayed on screen for all to see and then alternatives changed, replaced, and added on the fly to encourage exploration and collaboration among a diverse audience. Also, if you have any modeling applications that you would like to consider using GoldSim for, email us at support@goldsim.com. We would be happy to assist with determining if GoldSim is a good fit for your project. A lot of research on stakeholder involvement in modeling building can be found by googling "system dynamics group model building". Thanks for the comment, SD. I started the search using your recommendation and found you are right. There are some good references out there. (from Rick K.) Yes, the SD literature does indeed include some excellent papers on group model building and stakeholder involvement. One key difference in this study from most SD analyses, however, is that due to its different focus (on feedback structure rather than prediction), SD rarely deals in detail with stochastic systems and probabilistic simulation (e.g., Sterman's 982 page book has a 9 page appendix on "noise"). 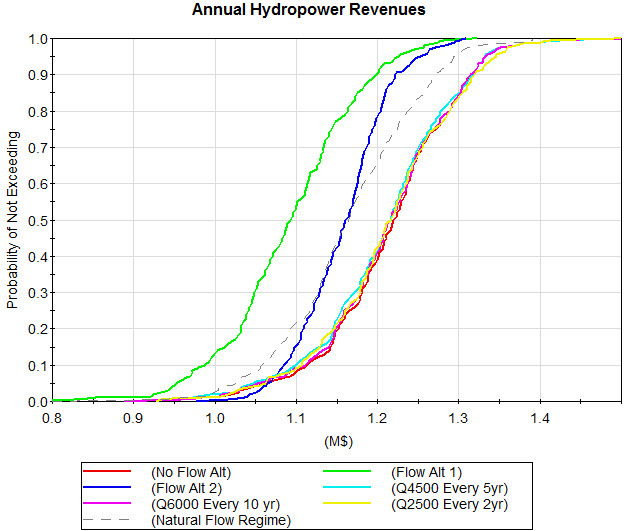 Engaging stakeholders in a discussion of a complex water resource problem without having the model accurately represent the inherent stochastic behavior of the system could be misleading.